Giveaway winners, plus authors galore! Random.org has decided that The Love Goddess’ Cooking School goes to… Joy! And Half a Life goes to… Juliann! Congratulations, ladies. I will contact you shortly for mailing addresses. Big thanks to everyone who participated. 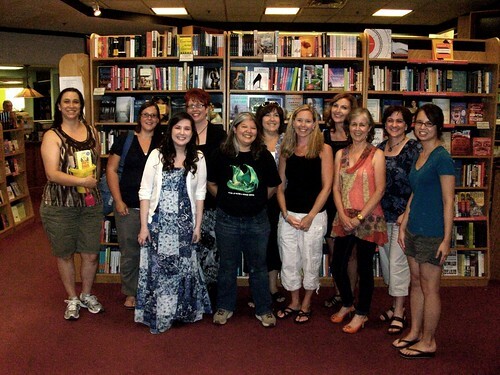 On Saturday Sarah, Stephanie, Joelle, and I attended a 7-author YA panel at Joseph-Beth. It was really cool to get to meet all these living, breathing, working authors and find out hey, they’re just regular people like you and me! I mean, we sort of knew that, right? But it’s still fun to get the in-person reminder. It was also a very diverse group, in terms of genre (not in germs of tenre, which is what I originally typed). Their books range from historical to paranormal romance to contemporary to murder mystery. If Romeo & Juliet were written about 30-year-olds, it would be pathetic. At 14, it’s beautiful and tragic. From L to R: Joelle, Sarah, Stephanie, Saundra Mitchell, Julie Kagawa, Linda Gerber, Kristina McBride, Sara Bennett Wealer, Julia Karr, Kay Cassidy, and me. I forgot about that quote by Saundra–she was full of hilarious stuff. I can’t wait to go to another signing!! I disagree with half of that Romeo & Juliet quote. Yes, 30 is a bit old to take it seriously, but 14 is also way too young. There’s a reason that every enactment of it that we see portrays them somewhere in the 18-22 range. I’m glad you had fun at the panel. I’ve never been to anything like that. There’s definitely a part of me that likes to believe there’s a wizard behind the curtain. 14 used to be a lot older than it is now, I guess, since people went to work earlier and died a lot earlier. And I think the other reason for aging up in performance is that there aren’t a lot of 14-year-olds who could act those parts properly. They did auditions for a year to find the leads in Let the Right One In, and I just read that the auditioned a thousand girls to find the actress who was in True Grit. The other part is connected with why Jerry Seinfeld said he ended his show even though it was still successful. He said that the older the characters got, the more pathetic it was that they were continuing to live that way. What a fun experience! I’ve gone to a few readings/signings recently, but never any in panel form like that. It sounds so interesting. Glad you had a great time! Unrelated to your post, but I *really* like your banner picture. What’s it from? 7 is a LOT, lol. Not a normal amount. But a panel of 3-4 can be really fun. So cool, Kristan! I have been meaning to make it to a local author signing, but they are typically evening events…I’m in bed by 8pm. LOL I do listen to author panels via podcast – they can give you the latest scoop on the biz. This one was on a Saturday. Definitely look for weekend events! But 8 PM, really? Lol.